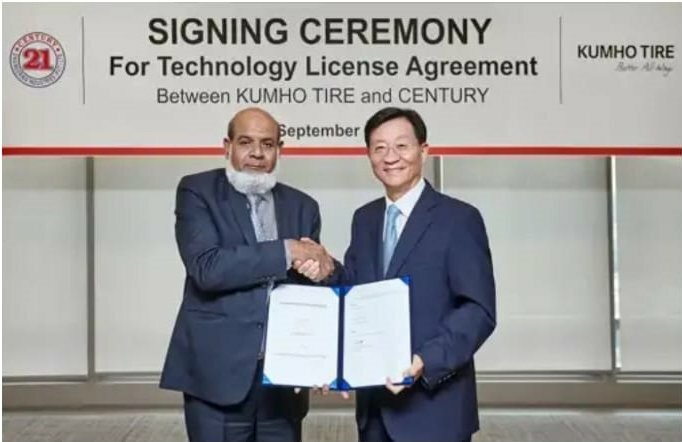 Kumho Tire Co. signed an agreement to transfer its tire manufacturing technology to Century Engineering Industries of Pakistan. Kumho called the agreement “monumental” for South Korea’s tire industry because it allows Kumho to enter into a developing country’s market. Under the 10-year agreement, Kumho will provide its technology to Century which also includes Kumho’s resources on design to quality control as well as education and problem-solving skills related to running a tire manufacturing business. Under the contract, Kumho will receive $5 million along with 2.5% of Century’s annual sales in royalties. A total of 28 tire products for passenger and commercial vehicles are subject to the deal, which will be renewable for another five years upon expiration. Century, a Pakistani-based battery manufacturer, has been committed to expanding its business portfolio by building a tire manufacturing line in Pakistan since May 2017. After Century’s research on global scale tire manufacturers, Century approached Kumho about its global business and technology with the hope of partnering with the tiremaker. Kumho said Century will improve upon Pakistan’s limited infrastructure for tire manufacturing by investing in a tire plant with hopes to expand its business in the automotive industry. Century forecasts it will manufacture a million tires per year and eventually aims to grow its annual capacity to 5 million units. Pakistan’s battery market saw a phenomenal growth during last decade, as the long hours of electricity blackouts compelled people to use available SLI batteries in their home and office Un-interrupted power supplies (UPS). SLI batteries are designed to provide high voltage current required at start an automobile for few seconds then they need to be charged. If exposed to long use- more than 40 percent of their total capacity-the thin lead plates start to break, making battery unusable. The disposable units are hard to repair. After the gradual increase in electricity production in recent years and availability of thick lead plate- long lasting – deep cycle batteries for solar and UPS use- the SLI batteries were restricted to automobile use mainly. Cut-throat competition, availability of modern alternate secondary storage units and improved regulations were other reason to seek diversification for the relatively new company. With robust network of existing battery sales force, the company is not eyeing new car entrants only but Suzuki, Honda and Toyota also in coming years, due to increasing bad quality perception of their existing vendor. Century is already supplying Phoenix batteries to Pak Suzuki Motors, Ghandhara Nissan cars and trucks, Al-Ghazi Tractors and Sazgar Rikshaw.